CLOSED FOR WINTER opens with a dead body being discovered in the summer cottage of a famous TV presenter. When Police Inspector William Wisting attends the site he is attached and his car stolen. With the corpse being…lost…before an identification can be made and one of their inspectors caught up in the night’s events, police are behind the eightball when beginning their investigation. Is it a case of robbery gone wrong or is the apparent drug connection something they should be tracking down? 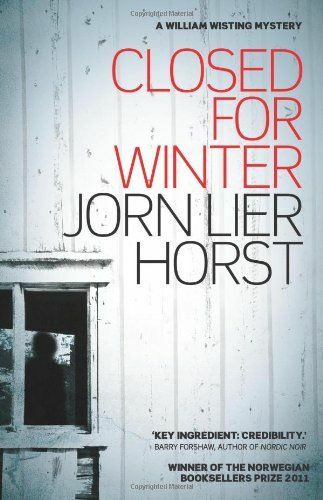 I was rather enchanted with the only other book of Jorn Lier Horst’s to have been translated into English so far (DREGS) but am afraid CLOSED FOR WINTER didn’t win me over in quite the same way. I don’t mean to say it’s bad, merely that it doesn’t have that elusive ‘something extra’ that elevates a book from the crowded middle of the pack. I suspect this is partly due to a personal prejudice of mine: I am bored by stories which deal with drugs, drug running, drug criminals and so on. But I also feel like this book had a lot more exposition than it needed, to the point that some of read as if it belonged more to the official reports and press releases I’m sure Horst has produced by the truckload in his capacity as a real-life police investigator than to a work of fiction. It’s not a particularly long book by today’s standards but even so it dragged a bit for me as it got bogged down in a lot of unnecessary, awkward details. There are things to like about the book though, including the way it explores the nature or motivation for criminality. During the last third of the story it becomes clear there are strong connections between the case and organised gangs working out of Lithuania so Wisting and one of his colleagues travel there to conduct interviews. Though they do indeed discover evidence of the kind of gangs they’ve been looking for they also see – or at least Wisting does – that the criminals are subject to a kind of poverty that simply doesn’t exist in Norway and he is noticeably affected by this. It did my jaded heart good to imagine there are high-ranking police who can still be touched in this way. CLOSED FOR WINTER is a fairly standard procedural that was entertaining enough to keep reading but something I feel like I’ll forget the details of fairly shortly. The writing is a little too stilted and the aspects that are meant to give the novel interest, such as the dramatic number of dead birds falling from the sky, were too easy to guess at for me to rate this in the top echelon of traditional crime novels. Bernadette – Thanks for your honest appraisal. I’m sorry to hear that this one didn’t really win you over the way Dregs did. I thought that was an excellent story. I know what you mean about exposition; some police procedurals do have a lot of it in them. Still, I”m probably going to read this one. I have to say I do like the William Wisting character. I’m also rather bored with drugs gangs – I know the police probably do spend a lot of time on that in real life, but it doesn’t interest me much in fiction. I think a lot of books fall into this category. Not bad but not great either and forgettable. What’s interesting is that I didn’t get through the first book at all because it was more “telling” than “showing” for me and I’m not a big fan of that at all and I don’t care for a lot of exposition either so, I think I may skip this one after all. I was thinking or hoping the second book would be better than the first one but I see that is not the case. Since reading Ruth Rendell it’s been a breath of fresh air to read a mystery that doesn’t include the drug trade. Thanks Bernadette. Thanks, it was good to get an idea of this author’s books. I haven’t bought any yet and I don’t need to add any new authors at this time, so I will hold off for now.